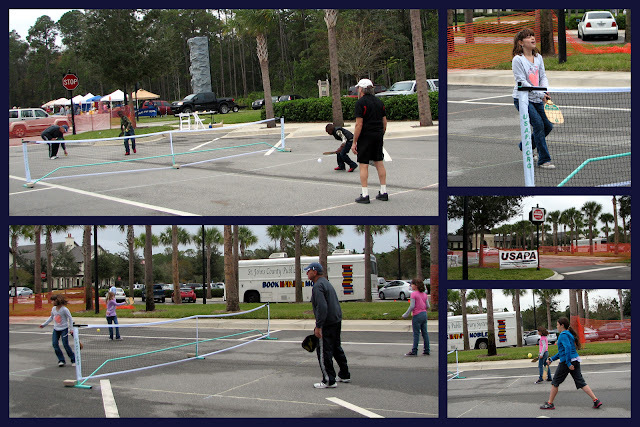 Bob shares some information and some pictures on the recent pickleball demonstration that a few of the players did at a recent Nocatee Farmers Market. The following is from the Nocatee Blog in an article titled Fit N Fun Nocatee Farmers Market Recap. Nocatee is a new coastal community in Northeast Florida that blends a variety of neighborhoods with schools, parks, libraries, recreation, offices, shopping, restaurants and so much more. Located in world renowned Ponte Vedra, Florida, Nocatee is just a few minutes away from pristine beaches, golf courses, business parks and major airports in downtown Jacksonville and St. Augustine. On Saturday, November 17th, residents and guests gathered on the Farmers Market Field to celebrate the Fit N’ Fun themed Nocatee Farmers Market with live-entertainment, a rock climbing wall, group exercise class demos, pickleball play, inflatable slides and 70+ local vendors. Lending to the ‘Fit N’ Fun’ theme, this Farmers Market featured a rock climbing wall and makeshift pickleball court. Set up in the Farmers Market Field corner, closest to the Greenway Trail System trailhead, this rock climbing wall had three different walls for climbers to choose. A pickleball court where everyone could learn more about “America’s Fastest Growing Sport” and practice their skills was set up by the USA Pickleball Association, USAPA. On the temporary court, in between the Farmers Market Field and Nocatee’s featured amenity - Splash Water Park, everyone enjoyed the ‘tennis like’ game and putting their forehand to good use. Bob reports on the day as well: We battled 25 mph winds and cold weather introducing this sport to several Nocatee residents. We hope to hold more events in the future. There were several interested players despite the lower attendance caused by the inclement weather. I am attaching some photos of the fun activity.